Home › News › My Man's Joining Disciple , What Do I Do? My Man's Joining Disciple , What Do I Do? Ladies, the first thing you need to know is that this is a Christian organization, and God has ordained the family. We want you to be involved! We are proud to have a Epic Marriage Ministry, and a Fatherhood Ministry. So what are you, the new chick on the block, supposed to do, and not do? When are you welcome to attend with him? How can you get involved in this radical new direction in your mans life? 1. Support your man. During the process of joining Disciple, your man is going to put a lot of time in. He's going to have to go to club houses, make runs with other clubs, put time into phone calls and meetings with the guys in his charter, and other states. I can promise that the process of becoming a Disciple is going to make him a better husband and father, and a better man of God. But that process is going to take up your valuable time with him, and the time taken can strain your relationship. Without your support, he'll be torn between his process of becoming a better man of God, and time away from his family. Your support will mean all the world to him, your understanding when he has to be gone, your willingness to travel with him, and your prayer that the enemy not come against him and distract him during this time will be invaluable. 2. Come on baby. Your man should say this to you a lot. We want the women to be involved, we want you to come out on the ride, we want you to come out to the event, you might have skills, abilities, things to add, and we're looking for that! Your willingness to travel along with your man, cook meals for the brothers, give us a place to stay when we're in from out of town, those things are sowing into the ministry! Yes we do have private business meetings, only members are allowed in those meetings. But those are rare. Most of the time, we'd love to have you along. Even at these meetings you're welcome to organize a separate ladies time as well. 3. Be flexible. The men are big on having a start time and end time. But men are NOT big on plans and itineraries. Be ready for things to change up because the Bros decide all the sudden that they want to go do something else. Be ready to go to the hospital when an accident happens. Be ready for your man to disappear to go and get the broken down motorcycle. Be ready for unexpected things to happen. If your husband is a prospect, there might be duties and responsibilities where suddenly he disappears on you for a little while. Be ready to hang out with the other sisters and brothers while duty calls. 4. Give me space. On that note, there may be weekends where your husband is primarily working, rather than spending time with you. This is especially true on a national run. Your man might spend his whole entire weekend running from one place to the next, fetching things for the brothers, fueling up motorcycles, cleaning up messes, cooking food. Wherever you can help him out, please do! But expect that there will be times where he's more focused on his duties as a prospect than on his wife who's also along with him. During these times reach out to the other brothers and sisters and build relationships. Don't feel like a third wheel just because you don't know people yet. 5. Put yourself out there. During the process of becoming a Disciple your man is going to meet a lot of people. So put a big smile on your face, and get ready to meet a lot of people too. Disciples from your charter, Disciples from other charters, men from other clubs, even big scary biker dudes from 1% clubs. Make a point of meeting the other women who are around, shaking hands, smiling, exchanging numbers if you have a good conversation with a lady, become Facebook friends. This too is ministry. There are a lot of hurting women in the biker world, who have experienced terrible things and need the non-judgmental love of Jesus. 6. Join the 43 Sisterhood. We have a hidden space for the ladies to congregate online. Joining this page gives you access to hundreds of women who just like you have gone through the same process. They are available to pray with you, give advice, welcome you and encourage you! There may also be a Sisterhood page for your specific charter. Your man can help you get connected with The Sisterhood. This way you already built relationships with ladies across the country, and around the world. When you meet them face-to-face at a run you already feel like old friends! To help identify yourself, get a ladies support t-shirt and a round support patch for the front of your vest. You get major points when we see a new girl show up already repping the black and gray! 7. Fear not! There is nothing scary about DCMC. We do go in some scary sounding places, but the fact of the matter is we know when and where to take you, or not take you. Quite frankly you're generally safer at a motorcycle clubhouse than a mall nowadays. The bikers from other clubs are just as liable to protect you as I am. This is when wearing Disciple gear will help identify you as ALREADY TAKEN, and others will know to watch out for you. Nothing bad is gonna happen, we roll with Jesus, and He protects you! 8. Keep your mouth shut. Now comes time for the hard stuff. Gossip is bad. Don't do it. If you are hearing gossip, have a concern or need clarification, talk to your man, to God, or to the leadership admins on the sisterhood page. Discussing club business is bad Bad BAD for you, and the club. 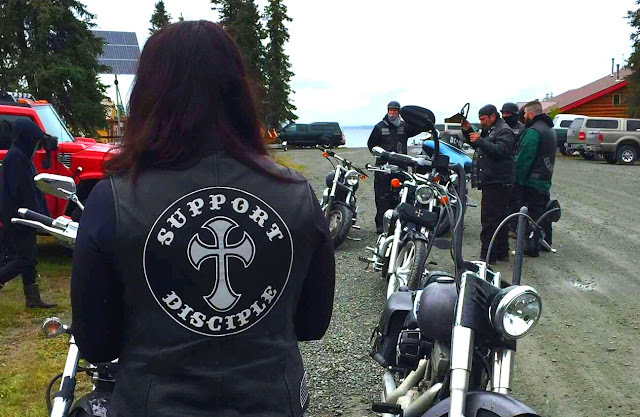 Disciple is a motorcycle club. You may see other clubs do or say inappropriate or illegal things. Silence is golden, if in doubt, check with your man. We welcome women along for the ride, to be part of what we do! But voting privileges only extend to male full patch members. This is a Brotherhood, your man may discuss things with you, and that's okay if he does. But you need to realize not to take those discussions outside of your home. You are not here to criticize how we do things verbally or on social media, tell us your view point about how things should be done, or stir up people against God's club. We have a God-ordained process built through experience and prayer. You may not understand everything that happens, but you can be certain that God is in control of this organization. If you have questions, you're free to ask your man, and if he has questions he's free to ask his leadership. But at the end of the day you may not understand everything that happens, or agree with it. Just know that it's necessary for the good of the organization, and is bringing men closer to God. 9. Discipline happens. We have rules and accountability. Your man may be disciplined, you might get shut down if you step out of line, you may see other men disciplined. You may not understand why someone got yelled at, prospected, or forced to do push-ups. And the fact is, I'm not going to tell you why I disciplined someone else, that's their story. And if they have a big mouth, they might spread their side of that all over, but it's only one side. Politely stop them and tell them you don't gossip, they need to take it to God. You may not agree with everything, let's face it, women do things differently than men. At the end of the day, talk it over with your man. There is a process for him to elevate a complaint all the way through his local, regional and national leadership, all the way to me in fact. But that's not your job. 10. Finally, just be here! Despite all the complications, know this, WE WANT YOU HERE. Women are gifted at things men despise. Planning, itineraries, shopping, cooking, helping, sympathizing, hospitality, prayer warrior duty, and MANY MORE things. We need your help! Despite all the aggravation and complications you may experience in a big group of loud individuals, you make Disciple Christian Motorcycle Club better! Please be as involved as possible, as we work together to Disciple your man to be the best man of God he can be!